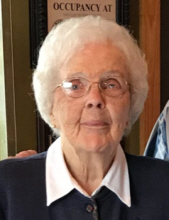 Ruth Helen Johnstone, 91, of Harrisonburg, VA, passed away on Friday, January 18, 2019 at Sentara RMH, Harrisonburg, VA.
Ruth was born on July 25, 1927 in Richmond, IL. She was the youngest of three girls to the late Richard G. Richardson and the late Helen K. Richardson. On March 21, 1959, she married her sweetheart, William C. Johnstone, who survives. Together they had two children; Richard C Johnstone, of Eldersburg, MD, Lynda H. Blackwell, of Harrisonburg, VA; and four grandchildren: Alysse Blackwell, of Shephardstown, WV, Ethan Blackwell, of Arlington, VA, Colin Johnstone, and Grant Johnstone. Before retiring with her husband to Harrisonburg, Ruth actively volunteered in the community of McLean, VA. Ruth was a dedicated and loving wife, mother and nana. She has been a member of Emmanuel Episcopal Church for the last 22 years. She enjoyed attending the JMU Women’s and Men’s basketball games with her husband. Ruth was preceded in death by her sisters, Ann Burnswick and Jean Fuchs as well as a nephew Donald Fuchs. The family would like to thank SRMH 4E, the Pallative Care team, and Chaplain Rene Hostetter from RMH who all treated Mom with dignity and the utmost of care. A private memorial service and burial will be held on Saturday, January 26, 2019. The service is being conducted by Ed Bachschmid of Emmanuel Episcopal Church. Arrangements are being handled by Johnson Funeral Home in Bridgewater, VA. Online condolences may be left at www.johnsonfs.com. In lieu of flowers, the family asks that any donations be made in Ruth’s memory to the American Cancer Society. To send flowers or a remembrance gift to the family of Ruth Helen Richardson Johnstone, please visit our Tribute Store. "Email Address" would like to share the life celebration of Ruth Helen Richardson Johnstone. Click on the "link" to go to share a favorite memory or leave a condolence message for the family.